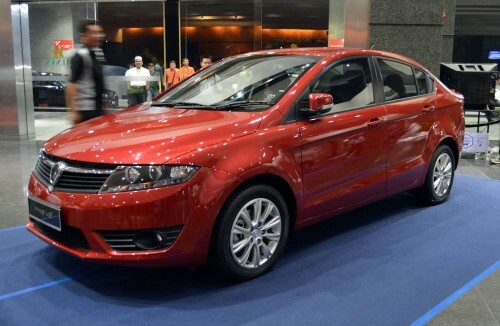 Proton Prevé was finally launched today with the sedan coming in at a low RM59,540 on the road, inclusive of insurance. Other variants of the new Proton Prevé sedan came at RM72,990 (1.6 Premium CFE metallic) and RM72,540 (1.6 Premium CFE solid), while the 1.6 Premium IAFM+ version goes for RM62,990 (metallic) and RM62,540 (solid) respectively. The cheapest variant which is the 1.6 MT Executive comes at at RM59,990 (metallic) and RM59,540 (solid). The Prevé is said to be made for international market as the national car manufacturer has made swift plans to export the Prevé to numerous potential countries this year, including Australia. Proton managing director was optimistic about the car at the launch as he claimed that the car symbolizes how Proton has evolved from a domestic and regional player into a global car company. The new sedan which has gained many praises was launched by Prime Minister, Datuk Seri Najib Tun Razak, at the Mines Malaysia International Exhibition and Convention Centre in Seri Kembangan. Beli Proton preve gaji 900 dapat reply ker…. Deposit rm 8000 macam mana…..